Oklahoma pedal masters, Keeley Electronics, have released the Retro Super Germanium Phat Mod. Ostensibly a distortion box, it covers everything from subtle drive to all-out fuzz, with a germanium amplifier at its heart. The drive pedal that has it all – the Retro Super Germanium Phat Mod from Keeley Electronics offers up a wide range of distorted characters, centred around a germanium amplifier. 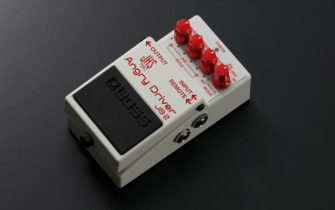 The pedal features different gain stages can impart a subtle distortion to the guitar tone, but with the germanium amp stage, it simulates the sound of distortion being fed into a cranked guitar amp. A second gain stage (enticingly titled “Nitro“) can then employed to pile on more saturation and open up the tonal territory to encompass soaring lead lines or heavy riffage. Keeley are on a hot streak of late, with the Retro Super Germanium following the recent release of their Aria compressor and overdrive. Visit Keeley for more details.